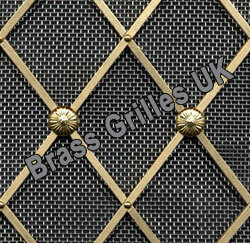 Beautiful, quality brass decorative grilles hand made to order. Ideal for use in radiator covers, bookcase and cabinet doors inserts, custom ventilation, fine furniture and interior screening. 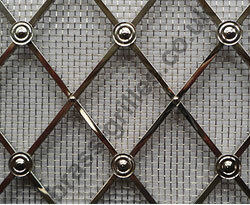 Almost, any combination of diamond size, rosette style and wire mesh can be chosen. 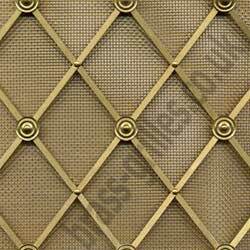 These solid brass grilles are also available in Antique Brass and Antique Copper or with Bronze (BMA), Pewter, Nickel or Chrome plating (at additional expense). 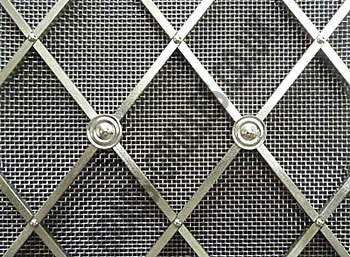 All brass grilles are sprayed with a fine clear lacquer to resist tarnishing and maintain appearance (unless specifically requested otherwise). Our workshop has over 25 years experience manufacturing this made to order product. "Just a note to let you know how delighted I am with the custom brass grill from your company. It arrived today, safely packaged, and unharmed by the long journey. It is just lovely. I installed it straight away, and couldn't be more pleased!" Many more viewable at our pricing calculator. All Floral Rosettes, Large Natural Brass Mesh Backing. - Made by hand to required size. - Cannot be cut by customer. Delivery: Usually in 1 to 2 weeks. Please visit our online calculator where you can experiment with options and create a beautiful handmade decorative grille to suit your style and budget. 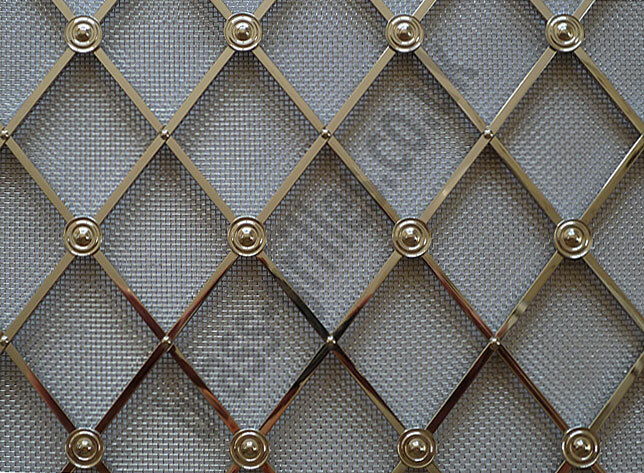 Alternate Plain Rosettes, Fine Natural Brass Mesh Backing. All Floral Rosettes, Fine Natural Brass Mesh Backing. 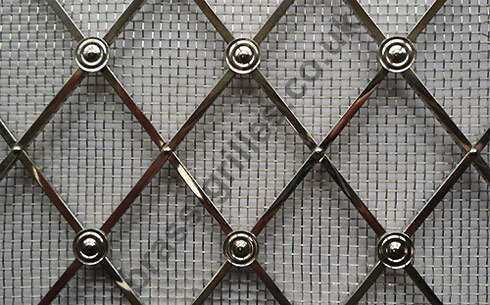 Regency Diamond Natural Brass Grille, 54mm Diamonds, All Floral Rosettes, Fine Natural Brass Mesh Backing. Alternate Floral Rosettes, Fine Stainless Steel Mesh Backing. 41mm Diamonds, Alternate Plain Rosettes, Fine Satin Chrome Mesh Backing. Delivery: Usually in 2 to 3 weeks. 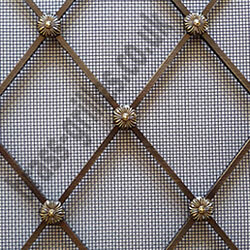 Regency Diamond Polished Chrome Grille, 41mm Diamonds, Alternate Plain Rosettes, Large Polish Chrome Mesh Backing. All Floral Rosettes, Fine Antiqued Brass Mesh Backing. Alternate Plain Rosettes, Fine Polished Nickel Mesh Backing. Regency Pewter 41mm Diamond, Alternate Floral Rosettes, Fine Pewter Mesh Backing. Alternate Plain Rosettes, Large Bronze Mesh Backing. 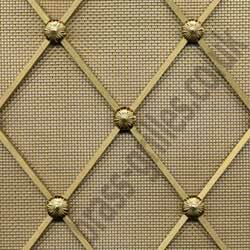 Alternate Plain Rosettes, Fine Antique Brass Mesh Backing. Alternate Floral Rosettes, Fine Antique Copper Mesh Backing. These decorative grilles are hand made to order from solid brass. Pricing varies greatly depending on your design choices. From the three available diamond sizes, smaller 25mm and 41mm diamonds, require more brass and labour in manufacture, so choose a 54mm diamond to lessen expense. The next biggest factor that affects pricing for this grille is adding a plating or treatment finish to the natural brass such as chrome plating or antiquing. This is an additional process which will add expense and also slightly increase the delivery timescale. If cost is an issue, we recommend that you start by pricing a 54mm diamond grille in natural brass, then experiment with further choices such as diamond size and plating to see how this adjusts cost. 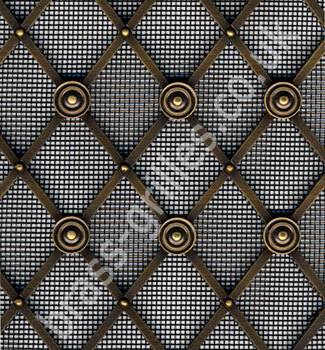 * These rosette types are only available for natural brass grilles. Please Note that backing meshes do not match the foreground diamond finish for all design combinations. E.g. 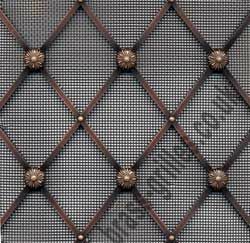 an all Antique Brass grille will have an even dark brown backing mesh and an all Antique Copper grille backing mesh is an even black. Please see the descriptions in the left column labelled "Choose Diamond Finish". 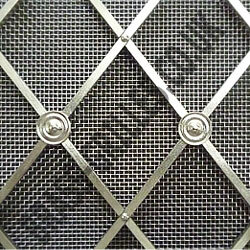 Plating and treatments such as chrome plating or antiquing are processes applied to the solid brass grille, increasing price and delivery time. 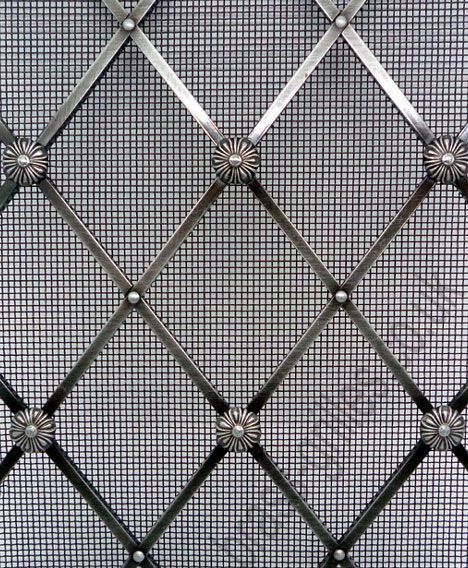 Regency natural brass grilles are treated with a fine clear lacquer to enhance and maintain their appearance unless requested otherwise. 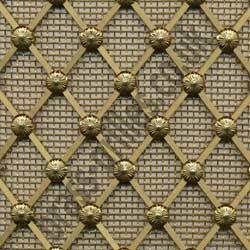 Regency brass grilles are manufactured symmetrically about the horizontal and vertical centre lines. 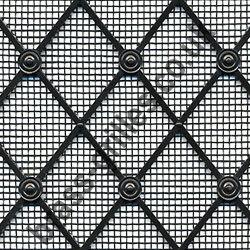 Same design grilles will therefore pattern match when fitted adjacent to each other along the same centre line (when manufactured on the same order). To install, simply use a small screw and washer though the backing mesh at the rear edge, at approx. 40mm intervals. There is no need to rebate the grille behind the opening unless the rear will be visible and you wish to provide a neater finish. You may however, fit how you wish. No fixings, beading or framing is supplied. 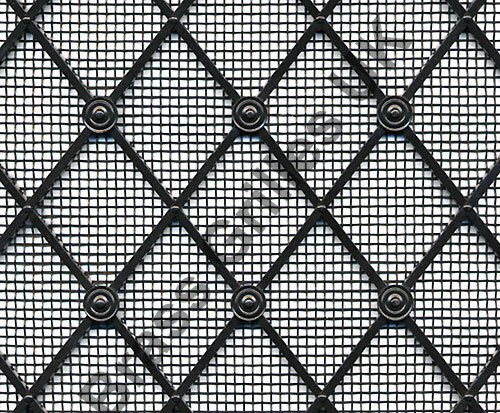 Grille edges are left as "raw" cut edges and are not intended for display. The depth of this grille at the edge, is approx. 5mm, depending on your style choices. (3mm square brass rod + mesh backing at 0.5mm or 1mm (fine/large) + a possible rivet head with it's turned down pin at the rear. Total = approx. 5mm). At the point of a rosette, depth is approx. 6mm. Please note that this style of grille has one displayable face and is constructed using traditional methods. The rear of the grille contains pins from your chosen rosette/rivet which secure the lattice construction and hold the backing mesh in place (if specified). Rosette/rivet pins by design have points which are turned down flush to the rear. This may be a consideration for you depending on your application. Please CLICK HERE to view the rear of an example Regency brass grille. Some finishes are applied by hand and therefore slight variations in shade may occur between orders placed at different times. 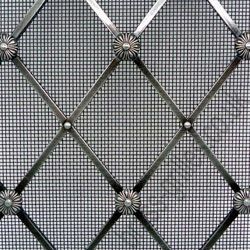 All brass grilles are sprayed with a fine clear lacquer to resist tarnishing and maintain appearance unless specifically requested otherwise. Grilles are manufactured to a tolerance of +/- 2mm per supplied dimension. Please visit our online calculator where you can experiment with options and create a beautiful decorative grille to suit your style and budget.